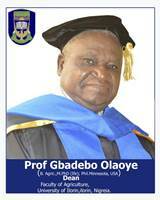 Professor Gbadebo Olaoye is a Plant Breeder by profession and holds B. Agric., M. Phil., (Plant Breeding) at the Obafemi Awolowo University, Ile –Ife, Nigeria as well as Ph. D. (Plant Breeding) at the University of Minnesota, St. Paul, MN, USA. He joined the services of the University of Ilorin in 1990, first as a Research fellow (Sugarcane Breeder) at the Unilorin Sugar Research Institute (USRI), Ilorin. He later transferred to the Department of Crop Production (now Department of Agronomy) in the same University and rose to the rank of a Professor of Plant Breeding in 2011. Professor Olaoye has served on the National Executive Committee (NEC) of Genetics Society of Nigeria (GSN) in several capacities including Editor-in-Chief, Vice President and President and he is currently the President, Sugarcane Technologist Society of Nigeria (STSN). Professor Olaoye is happily married with children.